The packages we’ll be looking at today should bring joy to the hearts of all Physical Scientists. Actually they should make any flavour of Scientist happy. The SIUnits(https://github.com/Keno/SIUnits.jl) package provides unit-checked operations for quantities expressed in SI units. It supports both long and short forms of units and all the expected arithmetic operations. Note that it only recognises the American spelling of “meter” and not the (IMHO correct) “metre”! But this is a small matter. And I don’t want to engage in any religious wars. Speaking of small matters, it’s possible to define new units of measure. Below we’ll define the micron and Angstrom along with their conversion functions. And now we can freely use these new units in computations. Read on below to find out about the Physical package. The Physical package is documented here. Apparently it’s not as performant as SIUnits but it does appear to have a wider scope of functionality. We’ll use it to address an issue raised on Day 17: converting between Imperial and Metric units. Let’s kick off by loading the package. There’s a lot of functionality available, but we are going to focus on just one thing: converting pounds and inches into kilograms and metres. First we define a pair of derived units. 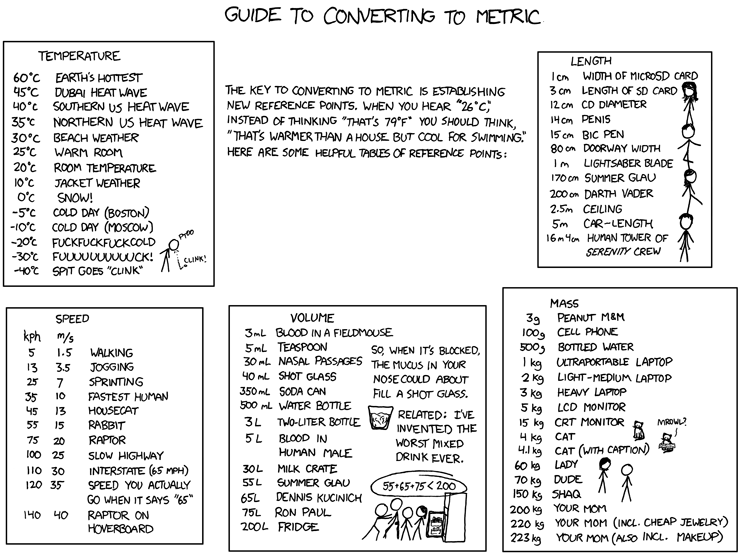 To do this, of course, we need to know the appropriate conversion factors! We can then freely change the average heights and weights that we saw earlier from Imperial to Metric units. On a related note I’ve just put together a package of physical constants for Julia. Units can be a contentious issue. Watch the video below to see what Richard Feynman had to say about the profusion of units used by Physicists to measure energy. Also check out the full code for today along with the index to the entire series of #MonthOfJulia posts on github. Next: MonthOfJulia Day 20: Calculus. Previous: MonthOfJulia Day 18: Plotting.